A self-identified metalhead, who is a creative, artistic, stylist was introduced to the concept of therapy through the movie Harold and Maude. She saw her first therapist because she had a bad boyfriend when she was younger. She was lucky enough to find a badass therapist, but the sessions ended quickly because the therapist moved away. She later found another counselor, but she lacked “fire.” Therapy ended with her because she felt like the counselor was disapproving of her romantic relationship. She searched for more therapists, but felt like all the therapists had “dead eyes” in their photos that turned her off. She eventually found a new badass therapist, that she is still seeing, but she had three important questions that she needed to answer correctly before making an appointment. Jeff, a licensed therapist and the host of Say More About That, talks with a metalhead about her experience of searching for a therapist and going to counseling. Why she first thought therapy was just for rebels. How she found her first badass therapist. Why she stopped seeing a therapist because she felt judged. What exactly pulled her in when contacting her current therapist who she really likes. Why it’s so important that she has a lot in common with her therapist. Are you subscribed to my “Say More About That”? If not, what are you waiting for? You won’t want you to miss an episode. We’ll be adding bonus episodes once in awhile and if you’re not subscribed, you might miss out. Click here to subscribe on iTunes! Did you enjoy the podcast? Please leave a rating and review the episode on iTunes. Those reviews lead other people find this podcast. You’ll help people learn about what therapy is like and how to find a counselor. Just click here to review, select “Ratings and Reviews” and “Write a Review” and let me know what your favorite part of the podcast is. Thank you! 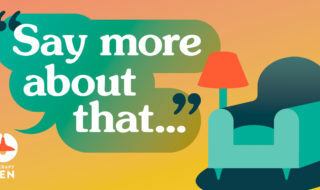 “Say More About That” Show Notes: Episode #5 – Kathy, a 43 year old woman, strategically addresses her issues with therapy. 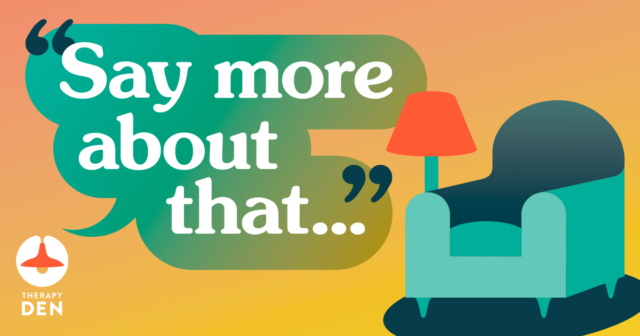 Say More About That Show Notes: Episode #4 – A 10 year old girl's search for a nice therapist.